The Tour de France begins this weekend! I need to get ready, I need to prepare, I need to understand who, what and where. If you too plan to watch coverage of the Tour de France, and who, I ask, would not, or even better, if you plan to attend, as I do - then we need to do our homework ahead of time to learn the basics of the race. What are the dates? What teams will be in the 2012 Tour de France? What riders will be in the Tour de France? What is the route of the Tour de France? What time will each stage begin and finish? Which stages should I make sure to see? Which riders should do well? What changes can we expect for 2012? Where can we watch Tour de France coverage on TV and online? And most importantly - where will I be! 1 Prologue, 20 stages, 2 rest days, 22 teams, 9 riders each. 11 of the 25 climbs in the Tour are in the Pyrenees. Only 3 of the stages have uphill finishes. 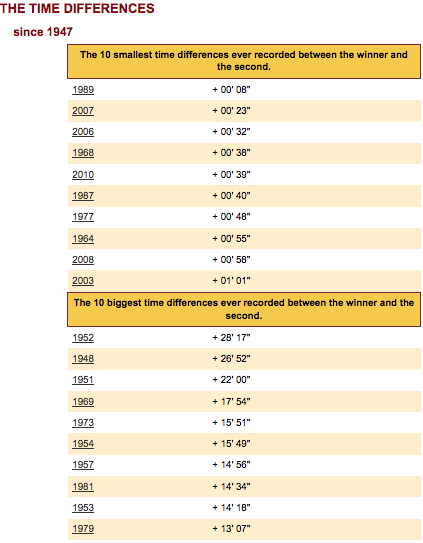 There will be 101.1 km of individual time trial in 2012. The Tour will begin in Belgium this year. It will also visit Switzerland. The Tour will flow in a clockwise direction in 2012. It rotates every other year - clockwise then counter-clockwise). There will be 9 new first ever stage towns in 2012. Of the podium finishers from 2011 (Evans, A.Schleck, Contador) only Evans will return in 2012. George Hincapie (USA) will set a record this year by racing seventeen times at the Tour de France. Approximately 2 million euros will be awarded to the teams and the riders, including 450,000 euros for the winner of the general individual classification (yellow jersey). The caravan gives away over 16 million gifts with € 200,000 to € 500,000 investment from each advertiser from 33 brands represented. 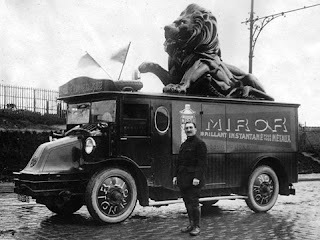 47% of spectators come first and foremost to see the caravan (learn more). 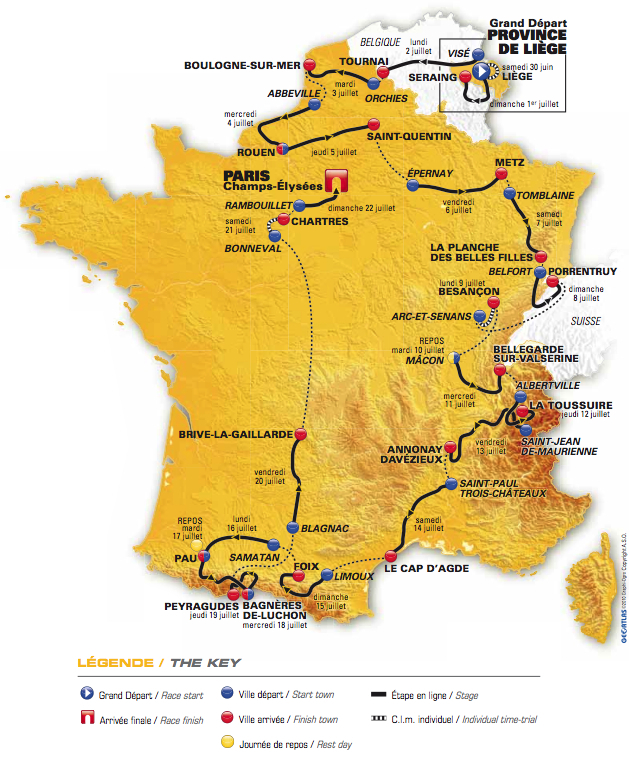 The 2012 Tour de France begins with a Prologue in Belgium, followed by 20 stages. The caravan, on the first day, will present at 12:00, the first rider in the Prologue will start at 14:00, the last rider will finish at 17:25. Most standard Tour de France days expect the Caravan to begin around 10:20am, the riders to start between 12:00 and 12:30 and finish shortly after 17:00. Stages 7, 9, 11, 16, 17, 19. 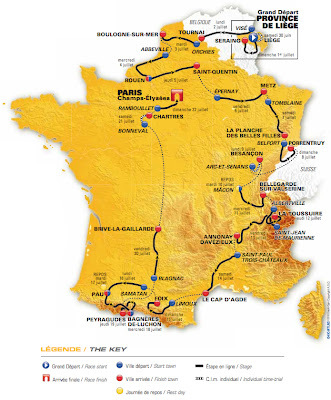 For a very complete excellent race preview please read: Tour de France 2012 Preview by road.cc with maps and profiles and route descriptions. Almost everyone has their eye on the top-5 candidates for overall victory: Cadel Evans (BMC), Bradley Wiggins (Sky), Vincenzo Nibali (Liquigas), Frank Schleck (RSNT), and Robert Gesink (Rabobank). I expect to see a surprise on the podium, but the riders I am most interested in watching are the young ones - the twins Peter and Martin Velits, Tejay van Garderen, Marcel Kittel, and especially Peter Sagan. The first week of the Tour, when the stages are in northern France, the fans will go crazy over Philippe Gilbert and Frank Schleck. When the Tour passes into Switzerland, the fans will turn out in support of Fabian Cancellara. The French have their favorite as well - Tommy Voeckler and his entire Europcar team. Expect to be entertained by the best riders to interview including Jens Voigt, Chris Horner, Pierre Rolland and Bernhard Eisel. NO BONUSES For this 2012 edition, no bonuses will be awarded in intermediate sprints and stage finishes. Official time remains the absolute reference. A SOLE INTERMEDIATE SPRINT As in 2011, the points for the green jersey classification will be awarded at stage arrivals and during the sole intermediate sprint in the straight stages. POINTS SCALE INCREASED IN THE MOUNTAINS For this 2012 edition, points will be awarded to the first ten riders who go over the top of the highest level mountain passes. The points will be doubled for summit finishes. For the schedule of TV coverage of the Tour de France, please read information by Pedal Dancer at How to watch the 2012 Tour de France. For online live coverage - both Steephill.TV and Cycling Fans compile the best online links for viewing. Steephill.TV also compiles the best list of articles and videos, and photos. The tracker app is this one in Australia - SBS Tour de France Skoda Tour Tracker 2012 at thetourtracker.com/. Twitter: If there is any one person I would recommend following on Twitter it would be Aussie Edy Budicin @edbud68, he sorts through and offers the best he finds out on the web and on Twitter - he will point you straight to the good stuff without wasting your time. Also the @Orica_GreenEDGE team is producing Backstage Pass videos that should be fun and informative throughout the tour. Maxime Monfort @maxmonfort is also worth a follow, so is Robbie McEwen ‏@mcewenrobbie, and Manuel Quinziato @manuelquinziato. VeloPeloton will bring you great local photography of the Pyrenees @velopeloton. And of course, please follow me @karenrake. 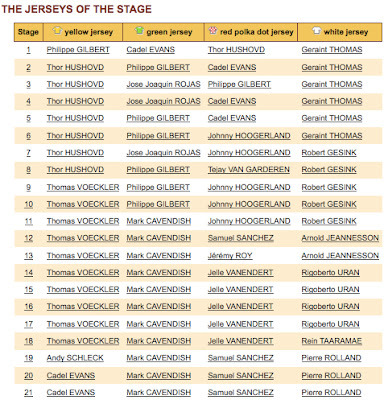 I am thrilled to be returning to France and will be attending Stage 10, 11, 13, 16, 17. Follow me on my journey as I photograph and write about my adventures across France. If you plan to travel to France yourself to see the Tour de France, please enjoy Pedal Dancer's FRANCE CYCLING page or the FRANCE TRAVEL page, for more ride information and travel tips. 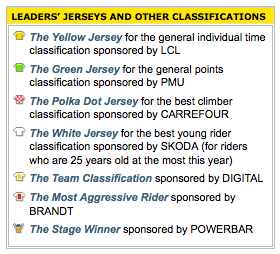 NOW FANS HAVE 2 OFFICIAL WEBSITES View the traditional old leTour website or view the fancy new leTour website. Trying to remember who wore the jerseys last year? 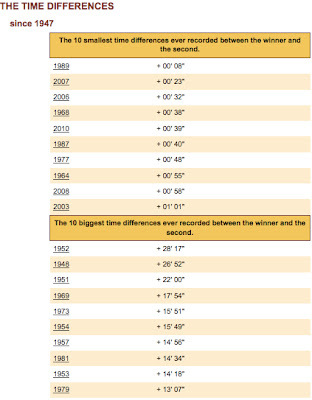 This should help you with your fantasy league picks, although .... 2012 is a whole new year.